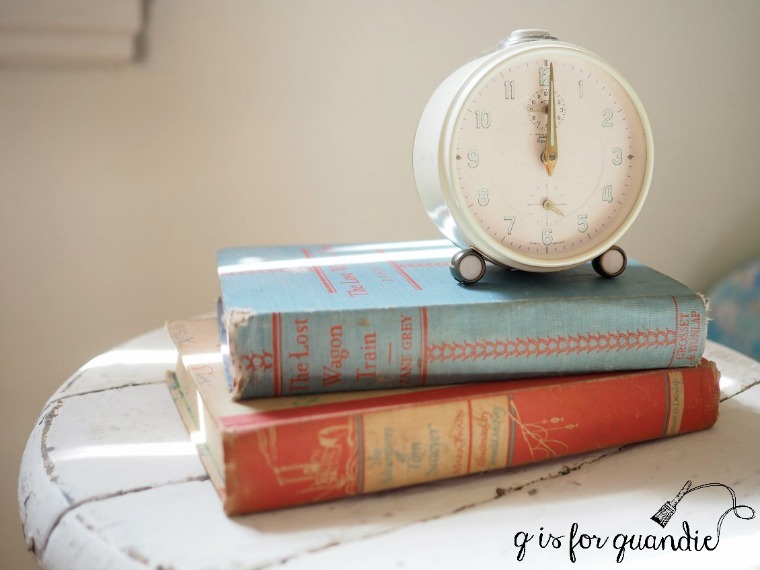 Last Friday I shared the beginnings of my guest room makeover with you. I didn’t really purposely ‘choose’ a color scheme for the room, it came about rather by chance. As I mentioned, the cupboard painted in Homestead House’s Laurentien milk paint was something I painted months ago not intending to keep. 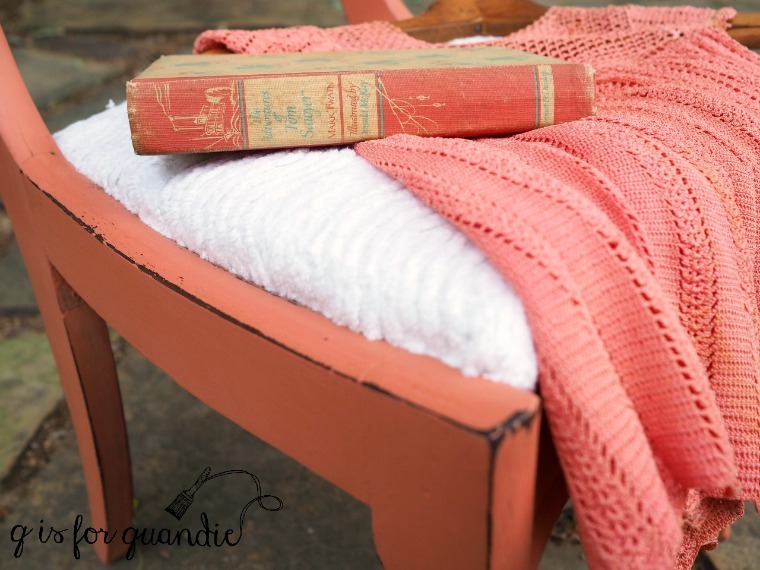 I added my mom’s little crocheted dress to the mix, and then realized that these two colors worked beautifully with a couple of vintage books I had and thus a color scheme was born. 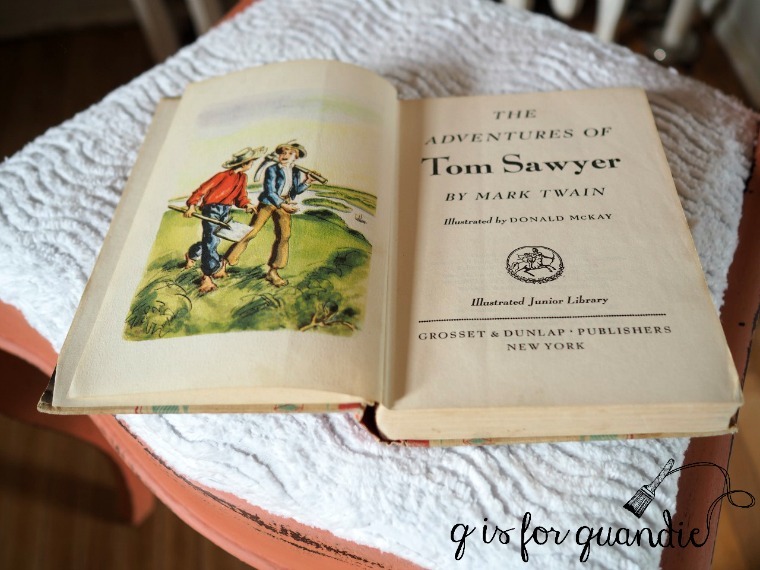 At that point I couldn’t help thinking that the dress and that Tom Sawyer book were both similar in color to Miss Mustard Seed’s Apron Strings milk paint. It’s not quite a pink, more of a coral, but a pink-ish coral. Hard to describe, but coincidentally all of these items are this same shade. Since I happened to have some Apron Strings on hand, I decided to keep an eye out for some small accent piece to paint for my guest room. So when I brought these chairs home on Saturday, I was inspired to paint one in Apron Strings. 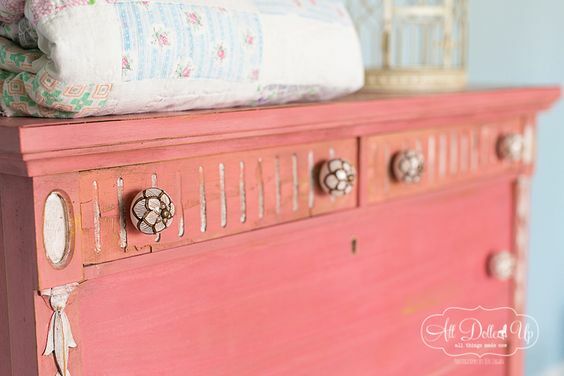 I’ve seen some pieces painted in Apron Strings on pinterest where the pigments show a fair amount of variation, like this gorgeous dresser from All Dolled Up. You can see that the paint has a little more yellow on the upper drawers, but is a little more pink on the lowers. Certain color pigments don’t always dissolve as well as others, especially the yellow. I actually love that look on the dresser above. I think it gives it a gorgeous, almost water color, sort of effect. I was hoping to get some of that color variation on my chair, but I really didn’t. I think I may have mixed my paint a little too well. I also thought I might get bleed through from the original dark stain, but there was none. I worried it might end up taking at least 3 coats of paint to get good coverage over that dark color (this was the darkest of the three chairs), but no, it just took two. I was also was prepared to get too much chipping because I didn’t prep the chair much at all. I just wiped it down with a damp rag. But again, no problem at all. In the long run, painting this chair could not have been any easier. Keep in mind that the existing finish was very worn and dried out. If the finish had been more recent, more shiny, more impervious, I would have either sanded it down more thoroughly before painting, or used a base coat of Fusion paint followed by the milk paint. Since I didn’t get much natural chipping I ‘created’ some with my masking tape method. I basically press some tape into the paint and then sort of rip it back off quickly. I use the yellow Frog tape (for delicate surfaces) for this. If you want more chipping you could try a stronger tape like regular masking tape. So to recap; very little prep, no primer, no pre-sanding, two coats of milk paint, some post-sanding, a little frog tape and then I added a final coat of hemp oil. I recovered the seat using some white chenille that I already had on hand. The chenille tones down the formality of the chair a bit. I’d initially thought the chair would work next to the cupboard, until I put it there and it looked like a miniature. OK, that photo is a bit misleading, it’s not really that small, but the cupboard is quite tall and the chair is a little on the petite side. So I’ve moved it over to the corner next to the radiator, a much better fit. By the way, I almost nabbed a Jenny Lind bed for my guest room at the garage sales last Saturday. There was one for sale for $5. But then I noticed it was missing a spindle. And it didn’t have side rails, just a headboard and foot board. Still … I debated grabbing it and using the foot board (which had all of its spindles) as a headboard. In the end I walked away though. I’m still holding out for the perfect find, but eventually this room is going to come together. Previous the day for chairs. Next taking a box from drab to fab. 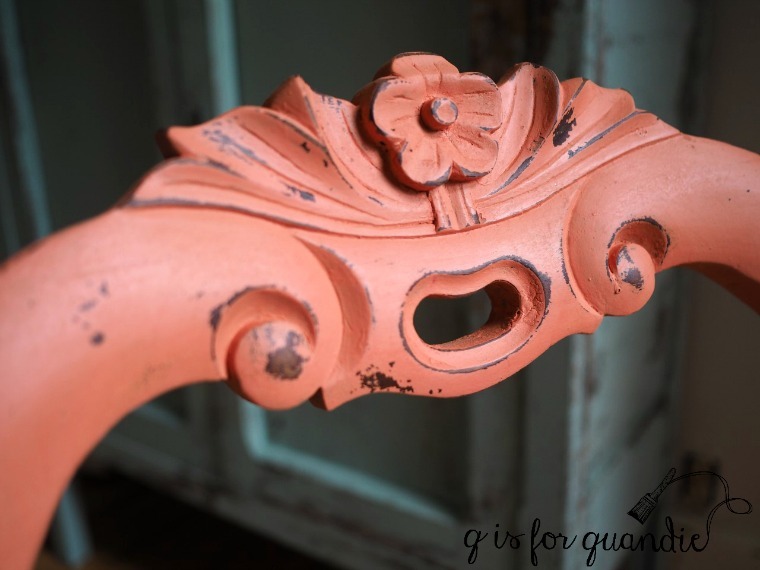 Is bleed thru a problem when using milk paint? 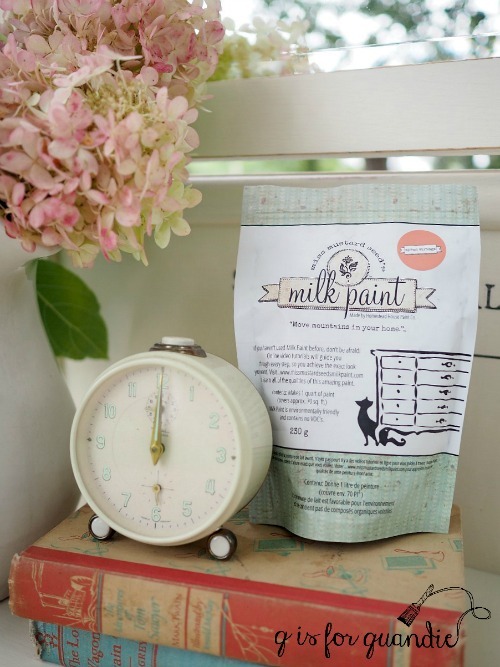 If you have a stain that is going to bleed thru paint, it’s going to bleed thru any kind of paint (including milk paint, chalk paint, acrylic paint, latex paint). It will also bleed thru certain primers. The best way to block bleed thru stain is with a stain blocking primer or shellac. I keep a spray can of shellac on hand for small spots of bleed thru. Just spray the spot then repaint. But if you have a piece that is pretty much a bleeder all over, I like to prime first with a clear primer like the one in the Rachel Ashwell line. Sometimes it’s hard to judge whether or not a stain is going to bleed thru, and sometimes it can take several hours to appear. 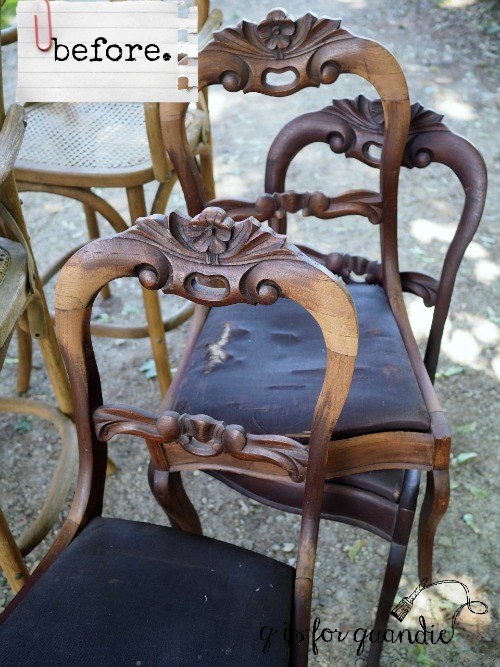 What color are you thinking of for your chairs? Ok, it’s Meggan. Got a new computer and have no idea why it used andr2013! Weird. Ha! I was wondering who andr2013 was, and how he/she was going to come and see everything! Too funny. I can’t wait to see this room! We might need to plan a girls night! Love the color scheme and love the chair. Can’t wait to see the room all done. I just need to find a bed! And a light fixture! Pretty, pretty, pretty just love the colors. Predicting solid bookings for the guest room. Maybe I should list it on Airbnb! I actually put that in my comment at first, Airbnb, and thought that might be presumptuous of me. But my daughter is seriously considering it since she lives in Charleston. The money is good. I love these two colors. My master bedroom is spa blue(soft aqua) and coral(more on the pink side). It is so relaxing. I have been debating about painting a chest at the end of my bed. 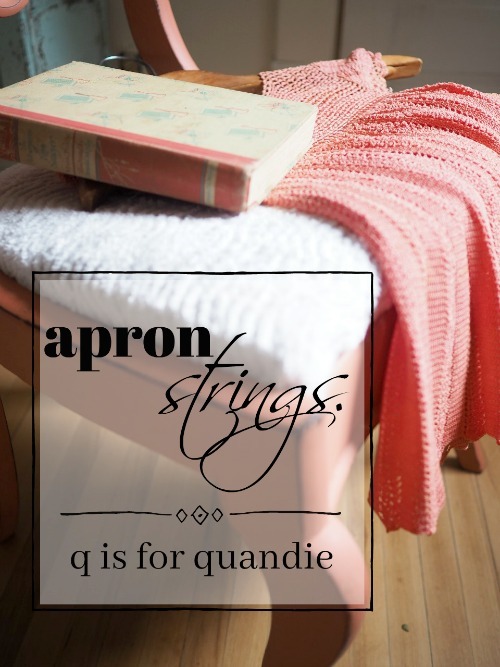 I had forgotten about MMS Apron strings. I might just have to try it. Living in Washington state gets gray and gloomy. This room for me adds a bit of spring/summer, even on the darkest days. I love your new guest room! Can’t wait to see what you come up with for a bed. I am sure that it will be fantastic! We get our fair share of grey days here in Minnesota too, especially in the upcoming months. Lately I’ve been noticing that this room is one of the brightest/sunniest spots in my house (the window faces south). Funny how I never noticed that when it was Mr. Q’s study, most likely because he kept the blinds shut most of the time so he could see his computer screen. And of course painting the walls white has made it brighter as well. So it has been fun to bring some brighter colors into the room and see how cheerful it has become. 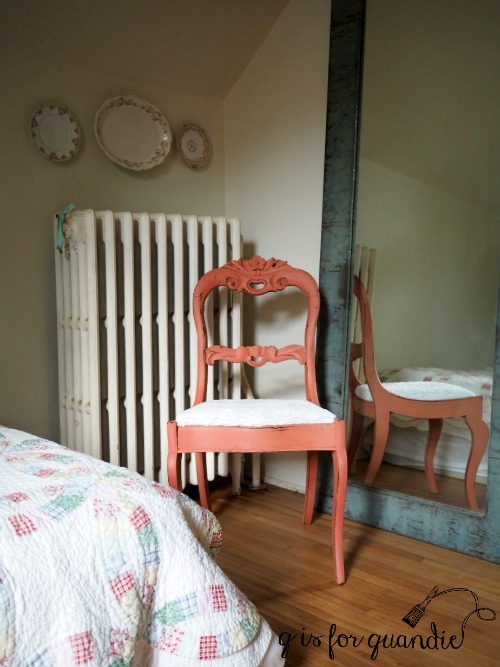 Love the color, love the adorable chair and I love that you used chenille on the seat! Looking forward to seeing the bed you find. I did one of my spare rooms in pink tones and it makes me happy when I go in there! I do feel a bit like this room is the last bastion for pink and flowery at my house. It will be just enough to satisfy my craving for a little bit of shabby chic. LOVE! This color combo is beautiful and the room is absolutely charming!